I intended to use the K145 device for monitoring simple heat flow experiments I was doing with my son and was not particularly interested in the equipment itself (other than it was cheap). I had assumed that the temperature sensor was a simple thermistor and the PIC just did an A/D conversion. It's much more elegant than that. The DS18S20 is itself a quite sophisticated and interesting IC that appears to do an A/D conversion and outputs a digital reading. It also has a limited instruction set. A detailed description of the sensor is available from Maxim/Dallas Semiconductor. 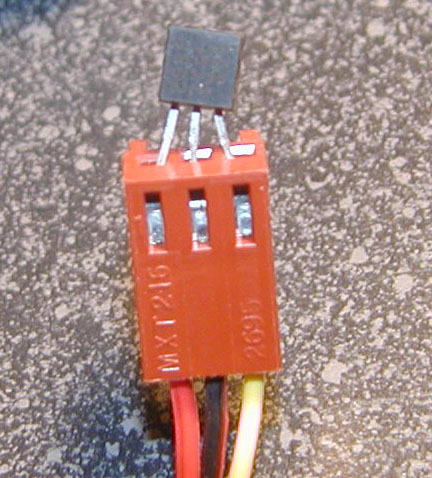 Because the output from the sensor is digital, it eliminates concerns about current or voltage loss in sensor leads as there would be for a thermistor. Although not related to this discussion, Maxim/Dallas Semiconductors also makes the amazing iButton thermocron which is a coin-size, self-contained temperature data logger that contains a clock, battery, storage, and some programmability. Even more remarkable, the device costs less than $20/unit (in large quantities). I used an inexpensive USB to serial "converter" to communicate with the K145, . I have found that I am only able to receive data from the K145 when using this converter... not when it is connected directly to the serial port. I am at a loss to explain why and am looking into it. These converters are quite inexpensive (~$10 US from Newegg). I spliced a Molex connectors taken from old cooling fans onto the sensor leads provided with kit and inserted the leads from the DS18S20 into that connector . From browsing through websites, it appears the K145 kit was developed by James Cameron as a PIC project and was subsequently distributed as a kit by Kitsrus who produced a PCB for it. The developer very generously provides the source code for the program that comes pre-installed on the PIC. An enterprising soul might consider altering the program to change sampling rate, reading precision, and take advantage of other features of the DS18S20... I'm not that enterprising (and PIC compilers are pricey). Instead, I've taken the output as a "given" and confined myself to working with it. Software for capturing the K145 output is available from several sites and terminal emulators such as ProComm may also be used. I developed the little Windows app I'm distributing here because it's more convenient for me not to use a DOS emulator. I wrote it with Visual Studio because it is provided by my employer and should not be construed as a knock on Java, Mac, or Linux... it's what I have available and can use at no cost. The K145 Monitoring Windows app may be downloaded here (current version is 1.03). A simple instruction manual may be accessed via the help pull down menu (Help>About). Because the program was written with the Visual Studio .Net compiler suite, Microsoft's .Net Framework must be installed. If you use Microsoft's online system "updater", installation of the .Net Framework has probably already been done (it is a "Recommended" update). Microsoft describes a simple way to check whether .Net Framework is already installed on your system here. Although the .Net Framework is a free download from Microsoft, it is rather large (23 MB). A simple users manual in pdf format is available here as well as via Help>About on the program itself (in chm format). Note: I am using Tripod because it would be inappropriate for me to use my employer's website. I have no control over the advertising that comes with Tripod (it seems a small price to pay for the service Tripod supplies at no cost).